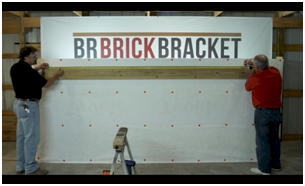 *When your home has an EWP rim board that you will be attaching the deck ledger to, different spacing other than the engineering stamped onsite spacing charts can be achieved for the BR Brick Bracket spacing. 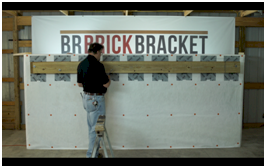 The onsite EWP engineer stamped bracket spacing charts are engineer spaced for an EWP rim board, with a manufacturer rating of an allowable load of 300lbs/350lbs per bracket/bolt. You may be using an EWP rim board that has a manufacturer rating of a higher allowable load than 350lbs per bracket/bolt. For example, some EWP manufactures have an allowable load of 400-650lbs per bracket/bolt. Using the NTA Inc. testing report, along with your specific EWP manufacturer's allowable loading numbers, your professional engineer can develop an engineer stamped spacing chart, specific to the manufacturer of the EWP rim board your home has installed that you will be attaching the deck ledger to. Water intrusion that gets to the homes Rim/Band Joists will cause rot, deck ledger failure and deck collapse. Thru-Bolts must be Hot-Dipped Galvanized or Stainless Steel. Read Installation Instructions Completely Before Installing. Install Fasteners ONLY in Provided Holes. If you are using 1-1/8" EWP Rim Board, it must be rated for at least an allowable load of 350lbs., if using 1" an allowable load of 300lbs. per ½" through bolts. (LAG BOLTS NOT ALLOWED). 1. Find the crown on your deck ledger board, then mark or chalk line across the entire top/crown of the deck ledger from end to end, (a bolt jig location line). For a 2"x 8" deck ledger, locate the line 3/8" down from the top. For a 2"x 10" deck ledger, locate the line ½" down from the top. 2. Use your Local Jurisdiction & EWP Manufactures minimum bottom and end clearances for the ½" through-bolts. 3. Locate what will be the permanent deck ledger location and temporarily fasten the deck ledger at that location. 4. 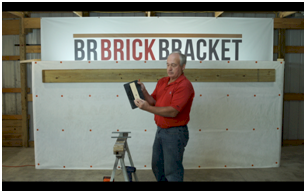 Using the Engineered BR Brick Bracket Spacing Table, (included with these instructions), locate the bolt spacing on the face of the deck ledger. The ½" through-bolts shall be staggered from the top to the bottom along the horizontal run of the deck ledger. 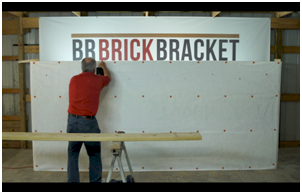 The Bracket will flip up and down creating a uniform top and bottom stagger pattern. 5. Make a "Bolt Hole Location Jig" the same size of the Bracket nose that the back of the deck ledger will fasten to with a small hole large enough for a pencil lead to go through, (see website for jig example).This small hole will allow you to mark your drill through holes for the ½" bolts onto the deck ledger. (Other jigs may be made). 6. 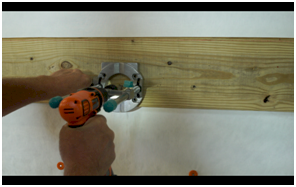 Using the "Bolt Jig Locator Line" you made on your deck ledger, take your "Bolt Hole Locator Jig" and place it to the "Bolt Jig Locator Line" that is on the face of the deck ledger at your drill through-hole locations, and then mark your drill through locations through your "Bolt Hole Location Jig". 7. THIS STEP IS CRUCIAL FOR AN EASY INSTALLATION!! Get a good portable drill guide, (we use guides purchased from Rockler Stores), and a 9/16" drill bit for your through deck ledger and through homes rim board holes to be drilled. Go to your jig marked holes and drill all bolt locations. Now remove temporarily fastened deck ledger. ), you can opt to skip this step. 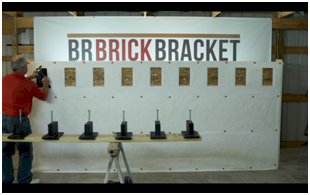 Take a Bracket as a template, a ½" through bolt and temporarily place the Bracket and through bolt at your drilled through locations. 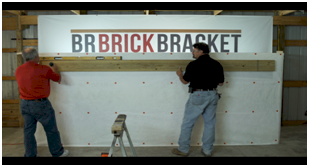 Trace the outline of the Bracket at your drilled through locations, remove Bracket and cut out subsiding. 9. Now take your Brackets and place at your cut out locations and fasten with at least 4 - 10D shank size nails at the top 4 locations. The tip of the 10D shank nail shall fully extend at least ¼" beyond the inside face of the home's rim board. If you only use 4 of the 6 nail holes, fill the other 2 holes with sealant and use sealant over the 4 installed nails to prevent water intrusion. 10. Now place your deck ledger to the Bracket and insert the ½" through bolts with washers at the head and nut leaving the bolts loose on the nose of the Bracket. On the nose of the Bracket, at the ½" through hole, is a conical shape designed to apply a sealant to stop water intrusion. 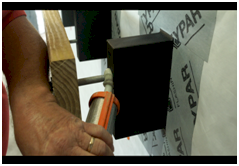 Apply your sealant and then tighten the ½" through bolts. 11. 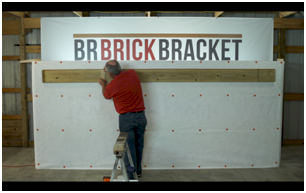 Go to www.brbrickbracket.com for an additional product, the "Bolt Keeper", with video of how this accessory can be used, along with an entire Installation Instructional Video for the BR Brick Bracket.